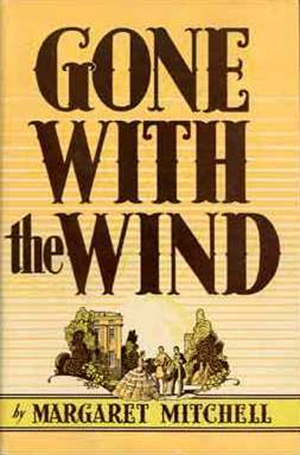 Published in June 1936, Gone With the Wind, Margaret Mitchell’s novel of the Old South, had been widely anticipated and was an overnight sensation. By the end of October 1936, the book had gone through twenty-three printings and been read by as many as a million people. In May 1937, Mitchell was awarded a Pulitzer Prize for the novel, which went on to sell over thirty million copies, making it one of the most popular books in history. At the same time, barely a month after its initial publication, legendary Hollywood producer David O. Selznick paid Mitchell $50,000 for the motion-picture rights, a record-breaking amount at the time. Casting for the movie, which included auditions across the South, provoked a frenzy of interest in Atlanta and elsewhere in 1937 and 1938. The film premiered in Atlanta in December 1939, was wildly popular, and in 1940 won ten Academy Awards, a record number that stood for twenty years. It remains one of the top-grossing films ever made. From the time she was negotiating her sale of the film rights in the summer of 1936, the conflict between the artist’s original vision and the film-maker’s far different take on the story was apparent. Throughout production, she fought constantly to protect the integrity of her work and was frustrated that the novel was almost immediately overwhelmed by exactly the kind of myths about the Old South that she was trying to debunk. Margaret Mitchell was a realist, part of the Lost Generation that came of age during and after World War I, and was one who prided herself on a lack of sentimentality. Stephen Vincent Benet was one who appreciated the realism of her work and the accuracy of her portrayal of characters, places, and events. Hers was not the stereotypical romance and others have noted that Scarlett O’Hara was much closer to gritty reality than the popular myth of the Southern belle. Likewise was the Tara of her book much closer to reality than the popular image of great Greek Revival mansions. In the late 1930s, the larger popular mythology of the Old South of white columns and magnolias was already taking shape, in part from the influence of the 1935 production of So Red the Rose, a romantic pot-boiler set amid the architectural grandeur of Natchez, Mississippi. But Atlanta and the rest of the north Georgia piedmont were far different from Natchez, and that difference was part of what Mitchell sought to convey in her book. Not only did Selznick misrepresent much of what she had written, the book’s images almost immediately merged with or were simply overwhelmed by the more-powerful, and often far-different images on the silver screen. To her great frustration, she would spend the better part of the remainder of her life trying to correct the distortions. Much like her characters, Tara evolved out of several sources, not the least of which was her maternal great-grandfather Philip Fitzgerald’s antebellum plantation in Clayton County. Born in Ireland in 1798, he was dead long before Mitchell was born, but his spinster daughters were still farming the place when she was growing up, and she spent happy summers there, absorbing their tales of the Civil War and Reconstruction. 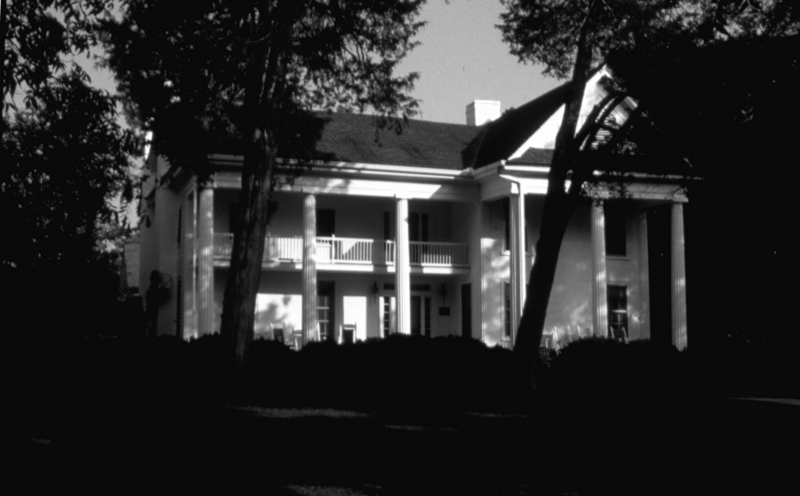 Located on several hundred rolling acres along the Flint River twenty miles south of Atlanta, the house itself had evolved around a two-story, plantation-plain style house built around 1830. Acquired by Fitzgerald in 1835, the house was wood-framed and had two rooms on each floor. Typical of the period, the kitchen was in a small structure detached from the house, but eventually connected by a breezeway. Simple as it was, in the 1850s, the house was at the center of what was, for the area, an exceptionally prosperous cotton plantation. Across the road from his house sat a handful of small cabins that housed the slaves who made it possible for Fitzgerald to remain one of the county’s largest cotton producers until his death in 1880. On the eave of the Civil War, Philip Fitzgerald owned thirty-four African-American slaves—only two other people in the county owned more. 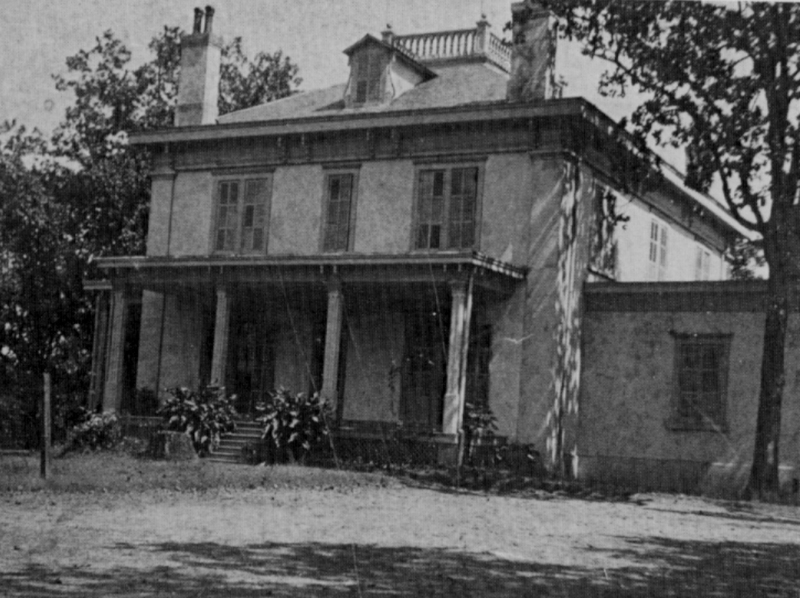 After the Civil War, Fitzgerald built a large addition to his house that both doubled the floor space and re-oriented the main entrance from the east to the north. A two-foot difference in ceiling height between the old and the new portions of the house added to the house’s somewhat disjointed, rambling character. By the time Mitchell knew it in the early twentieth century, the passing years must have given it an aura of antiquity to her young eyes, more accustomed to the bustle of Atlanta. When she needed a setting for her novel of the Old South, she looked no further than her ancestors’ plantation. In the end, however, her narrative description of Tara left much to the imagination. The name itself conjured up images of ancient Ireland and the Hill of Tara, the legendary seat of the High Kings of Ireland in the Dark Ages before the Norman conquest. Her actual description of the house itself, however, is accomplished in a few brief passages, the first early in the first chapter when she writes simply of “the white-washed, brick plantation house” and its setting on the Flint River. There is no other descriptive information until Chapter III, where she essentially completes her description of the house. It was built by slave labor, a clumsy sprawling building that crowned the rise of ground overlooking the green incline of pasture land running down to the river; and it pleased Gerald greatly, for, even when new, it wore a look of mellowed years. The house had been built according to no architectural plan whatever, with extra rooms added where and when it seemed convenient, but with Ellen’s care and attention, it gained a charm that made up for its lack of design. . . . The wisteria tumbling over the verandas showed bright against the whitewashed brick, and it joined with the pink crepe myrtle bushes by the door and the white-blossomed magnolias in the yard to disguise some of the awkward lines of the house. Except for the setting, there is little of the Fitzgerald house in the book, and tourists were routinely disappointed when they saw it. The house did have a rather rambling floor plan but it was wood-framed, not masonry; was most likely not built by slaves; and it did not even face the river. 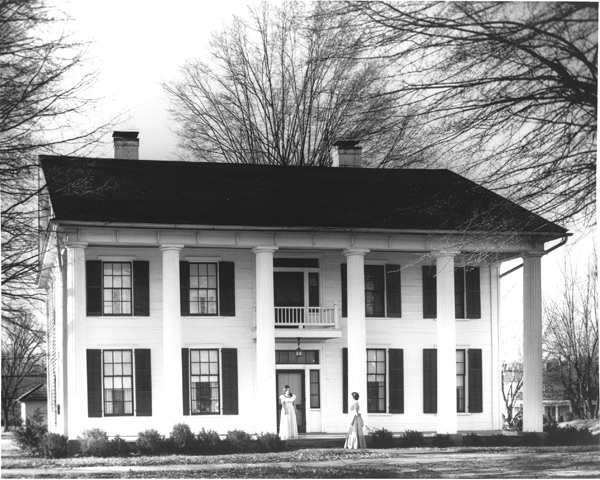 She knew other antebellum buildings, of course, including several of the handful of Atlanta’s great houses that still survived from the antebellum period. Even the Leyden House with the city’s only example of the classic Greek Revival peripteral portico—decidedly not her inspiration for Tara—was still standing when she was a child. Some think Lemuel P. Grant’s big boxy house on St. Paul Place just southeast of downtown Atlanta was part of Mitchell’s inspiration for Tara. Built in 1858 by the man who designed the city’s defenses during the Civil War, the house was stucco-covered brick, scored to resemble stone, a typical treatment for a house of that period. Typical too of the late 1850s, it was more Italianate than Greek Revival in its design, but it was an authentic survivor from the Old South and, when she died in 1949, Mitchell was trying to see that the then-neglected house was preserved. As her book took shape, Mitchell spent endless hours in the library, talking to academics and others, and checking and re-checking her facts. “[W]hat ever else may be wrong with my book,” she said, “I do want it to be accurate.” Her father was one of the founding members of the Atlanta Historical Society and his original research on Atlanta place names and other topics was part of his daughter’s fact-checking for her book. 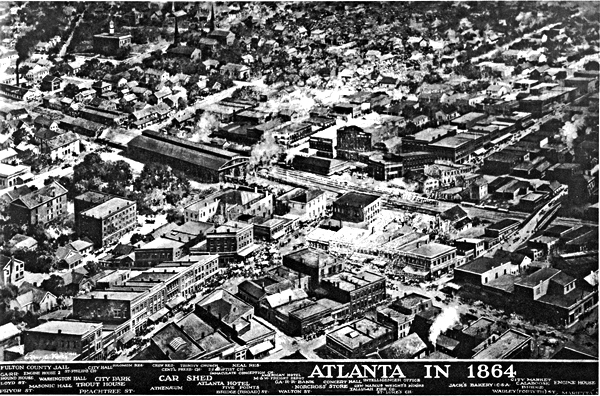 In addition to her father, Mitchell consulted the noted Atlanta artist and historian Wilbur G. Kurtz, who was considered an authority on local history, especially that surrounding the Civil War. He had written and illustrated a book on the city’s history that was published in 1929, painted murals in Georgia’s contribution to the Chicago World’s Fair in 1933, and supervised a WPA-funded restoration of Atlanta’s Cyclorama in 1934-1935. She also had the help of her friend Sue Myrick, a reporter at the Macon Telegraph, and a variety of academics and other consultants, not the least of which were the many people still alive in the 1920s who had vivid memories of the Civil War and Reconstruction. Whatever the sources, and there were many, Mitchell made herself an expert on the area’s antebellum architecture, and she did the same with questions of speech, dress, manners, and many other aspects of the antebellum South. She knew what she wanted to portray and knew that Atlanta and Clayton County simply did not have the white-columned mansions that the public was coming to expect, especially after Hollywood’s 1935 production of So Red the Rose, which was set in Natchez, Mississippi. 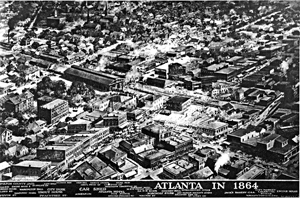 But Clayton County and Atlanta were not Natchez, and there were never the great sprawling plantations with white-columned mansions that could be found in the lower Piedmont and southwest Georgia, much less the opulent palaces on the vast sugar and cotton plantations along the Mississippi River. In any case, the best architecture was found in the cities and towns of the Georgia Piedmont, not in the countryside. All of that was fact—not all of it suited Hollywood. Figure 11. One of the best-known images of Tara. 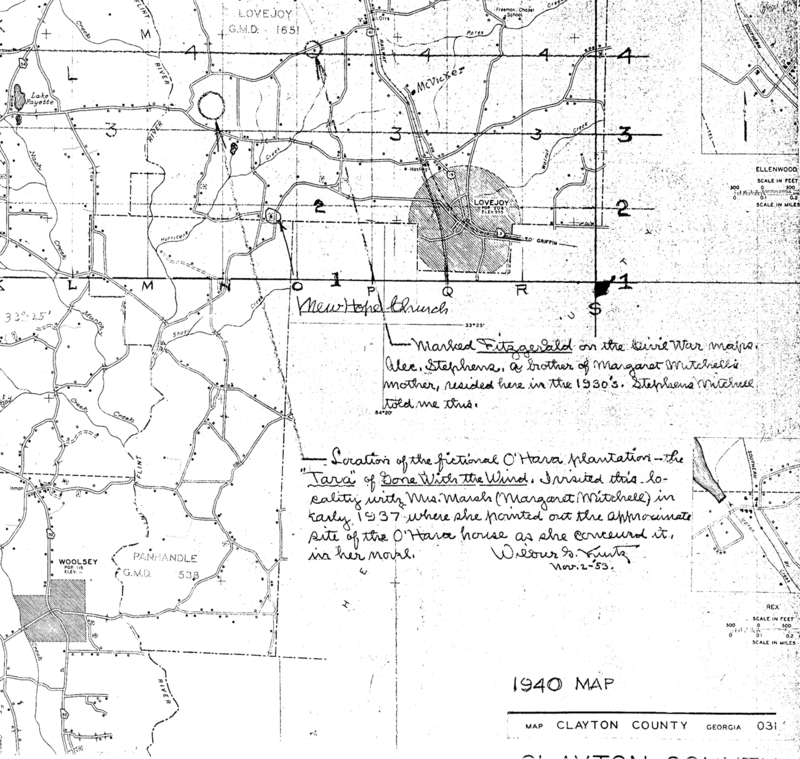 I had tried to prepare them by reiterating that this section of North Georgia was new and crude compared with other sections of the South, and white columns were the exception rather than the rule. I besought them to please leave Tara ugly, sprawling, columnless, and they agreed. I imagine, however, that when it comes to Twelve Oaks, they will put columns all around the house and make it as large as our new city auditorium. In the fall of 1937, Selznick hired William Cameron Menzies (1896-1957) as production designer for the film. Working primarily from his own reading of the novel, Menzies produced hundreds of watercolor storyboards that, even before Victor Fleming (1883-1949) signed on as the film's final director, had determined the overall look of the film. Decisions were being made with or without Mitchell’s consent. From these storyboards, the film's art director, Lyle Wheeler (1905-1990), produced final set designs and specifications for the construction department. Trained in architecture, Wheeler also constructed scale models of the sets that were used to check design, camera angles and lighting. By the time filming was complete, Wheeler had supervised construction of ninety interior and exterior sets, including over fifty full-size structures. In 1940, his was one of eight Academy Awards won by Gone With the Wind. Selznick had pledged a faithful rendition of the book but had a somewhat liberal interpretation of what that meant. Still he was aiming for authenticity at all levels, most especially set and costume design. Walter Plunkett, Selznick’s costume designer, was even commissioning textile mills to reproduce authentic antique cloth. At Mitchell’s recommendation, Selznick hired Kurtz and Myrick to act as what Mitchell good-naturedly mocked as “Southern Experts,” and that they were, although only Kurtz would make the film’s credits. In spite of the temporary materials with which the set was constructed, great care was taken to ensure the illusion of not only a real house but an authentic, antebellum house at that. Kurtz was largely responsible for the many authentic details that appeared in the design and construction of the sets and props used in the filming. Among such details were the false pegs that were used to create the illusion of mortise-and-tenon joints on the steps of the breezeway and wooden glazing strips that were used in two window sash intended for close-up scenes. The site for construction of the Tara set was Selznick International Studios' "Forty Acres" production lot in Culver City, California, about eleven miles west of downtown Los Angeles. Actually amounting to only 29 acres, it was originally leased for Cecil B. DeMille’s 1927 production of King of Kings, which included his recreation of ancient Jerusalem. In 1933, the RKO Studio production of King Kong re-used parts of the Jerusalem set, and most of that was still standing when Selznick leased “the back forty,” as it was often called. 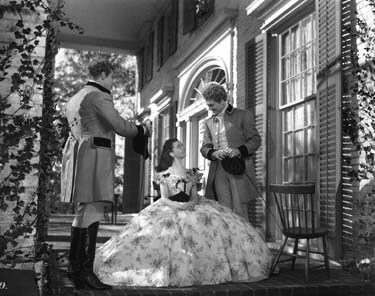 When it came time to begin filming Gone With the Wind, the first order of business was to clear the lot of the older sets so that Atlanta in 1864 could be recreated on the site. 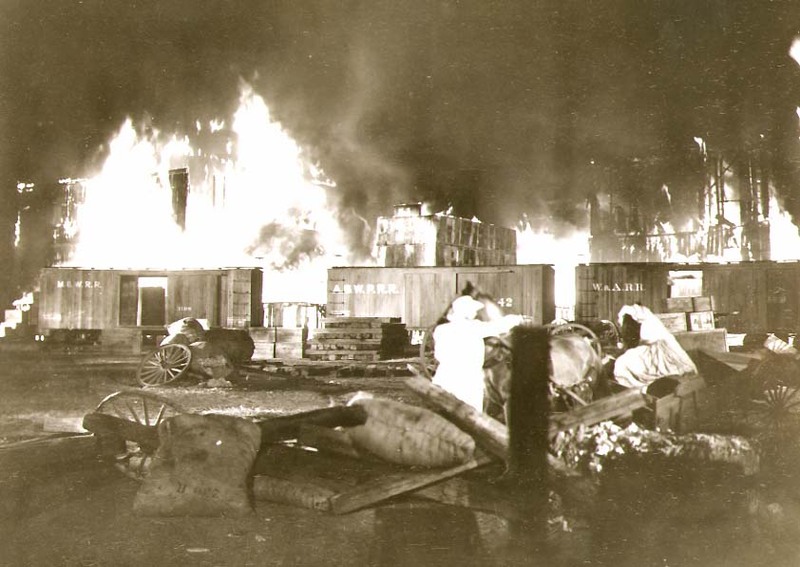 So, even before casting was complete, the filming for Gone With the Wind got underway on 10 December 1938 when the great wooden sets from King Kong, King of Kings, and other films were burned. Reworked with the help of Kurtz and fed by gas from a network of piping that allowed some control of the flames, the burning sets formed the backdrop for the scenes of the burning of Atlanta. 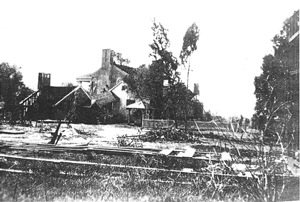 With their destruction, construction of Tara and the town of Atlanta began. As Selznick himself stated in 1959, "Tara had no rooms inside. It was just a facade. So much of Hollywood is just a facade...." Still, it was not just two-dimensional. The entire front and right side of the main house were completed, parts of the left side of the main house, three sides of the kitchen and all sides of the connecting breezeway. Only the front halves of these structures appear to have been roofed, although cornice was installed down the rear slope of the right side of the main house and on both sides of the rear slope of the kitchen roof. 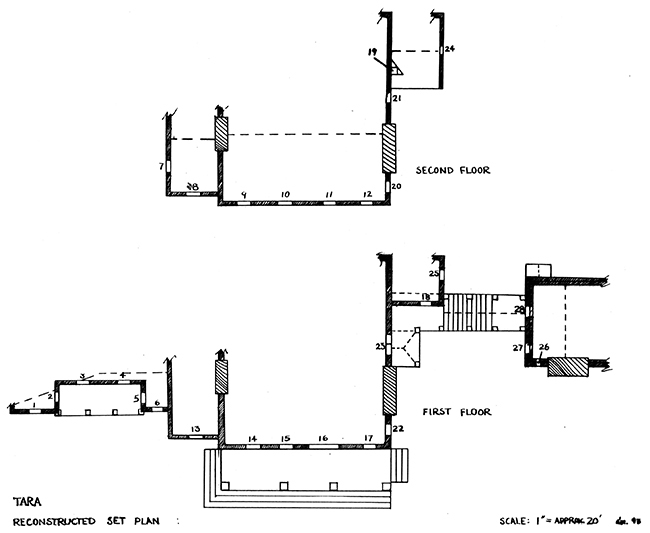 If the 1959 plan dimensions are a correct approximation of the original set dimensions, the Tara set stretched nearly 180' from the end of the left wing to the back of the kitchen. Overall height was about 36' from ground to ridge line. The basic framing of the structure appears to have been a simple 2x4 "stick" frame. The walls were constructed of standard two-by-fours, 24" between centers with furring strips nailed every 24" to create a grid of 24" squares. The exact extent of roof rafters and other required bracing material to support the front facades from the rear are not readily discernible although parts of it are evident in some of the historic photographs in 1959. The framework was then covered with a synthetic brick material that was installed in 24" by 48" panels with staggered joints (thus the framing layout). The panels were approximately ½" thick with a raised brick pattern stamped from a cementious material with what was perhaps asbestos fibers as a binder, similar to a thicker and more coarsely composed version of mid-twentieth-century, cement-asbestos siding. Wilbur Kurtz described it as composition board, "the kind you get at Sears." Others have referred to it as papier-mache. Only the brick columns and floor of the front porch were actually brick and mortar. All of the architectural detail of the set was constructed in wood, mostly fir or spruce with some redwood. Plywood with applied moldings was used extensively on the set. 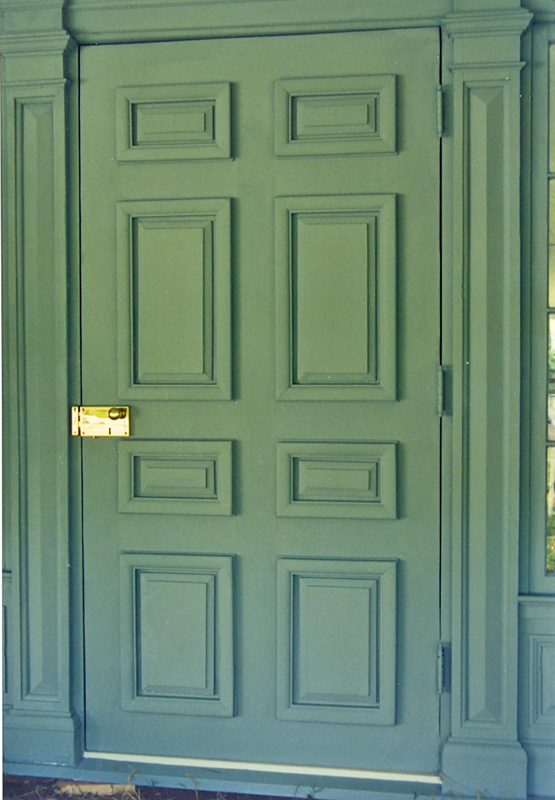 The front door, for example, was constructed with a solid wood frame faced with ¼" three-ply laminated wood and applied moldings and panels. Similar construction was used in the panels under the entrance sidelights and other windows. Once built, the set was painted with a typical linseed-oil based paint with little sheen so as not to reflect set lighting. The left wing, which is little seen in the movie, appears to have been painted a reddish color to imitate unpainted brick. Two examples of the art and fine craft that went into construction of the Tara set are worth noting. The first concerns the simple glazing of windows. While most of the glass was puttied into place, the glass in the entrance sidelights and in three other windows were finished with old-fashioned wooden glazing strips rather than putty. The sidelights are clearly visible in several scenes, although there are probably very few viewers who have noticed the difference. The same attention to small detail in a part of the set that was shown at close range is found in the wide steps of the breezeway. Constructed of clear lumber, the treads have had a series of artificial "knots" created in them, more authentic for what were supposed to be steps constructed of 3" by 16" lumber. In contrast, simpler methods were used where fine detail would not be visible during filming. In addition to the use of synthetic brick and plywood on the set, noted above, expedients were also taken in construction methods on occasion. 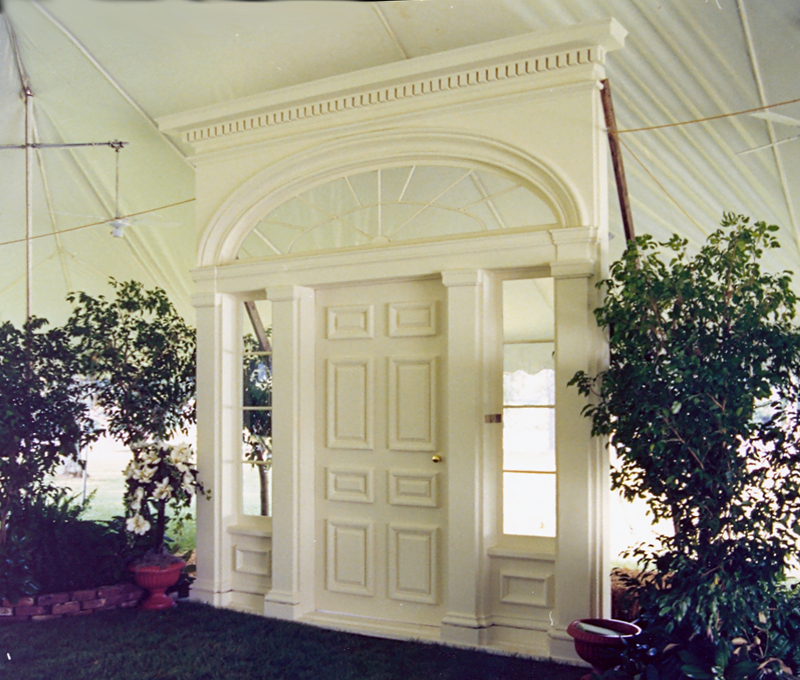 The shutters on the set, for instance, were constructed to appear as movable louvered shutters, complete with tilt bar. However, the individual slats are simply toe-nailed into the shutter stiles with four small brads, leaving the louvers inoperable. The set itself was altered considerably during the course of filming. As noted previously, the set was "distressed" for filming of the scenes after the war. In addition, during restoration of the entrance, it was noted that the sidelights of the entrance were apparently relocated during filming, presumably to provide the proper "reveal" between the edge of the sidelight sills and the edge of the jambs. Although all of the interiors for Tara were created and shot on interior sound stages, at least a few interior elements were included in the exterior Tara set. Because they might be visible from the exterior in some shots, the interior jamb panels for the three first-floor windows on the front porch were installed. The most important interior element on the set was the complete interior trim for the front entrance. Painted blue, it appears to have been used in filming part of the night scene in the front hall early in the movie, although the final scene was actually a combination of shots of the sound-stage set of the hall itself, the interior and exterior of the Tara set on the Back Forty, and background art work, all skillfully combined into a single moving image. That accounts for the finished nature of the interior of the entrance and also helps explain the relocation of the sidelights that apparently occurred during filming. While built on a simple wood framework, Tara was supposed to look like a structure with twelve-inch thick brick walls. Set in the relatively narrow wood frame of the entrance way, the setback of the sidelights was placed correctly for filming of the first scene on the front porch, but appeared too shallow for the interior shot and so was relocated forward for that scene. There it stayed and is seen again in an exterior scene after the war in the "wrong" place. Since it was not a real building, construction of Tara went quickly. Built on a simple, light frame of standard two-by-four lumber, the set had only two sides that were completely finished and much of that was sham. The brick steps and four great columns of the front porch and even the windows and doors, soffit and trim were real enough, but the remainder of the “brick” was stamped on rectangular panels and nailed to the two-by-four framework. There was no interior, since all of the interior shots were done on a sound stage nearby. 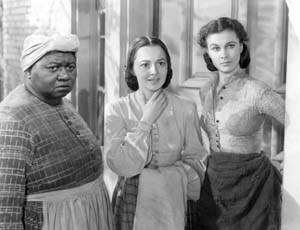 The first scene forced Hattie McDaniel to appear leaning out a second-floor window while perched on a scaffold inside the structure. The set was completed by the time filming officially began on 26 January 1939. The first shot was the film's opening scene on the front porch at Tara, the only scene in which Tara appears in undamaged condition. In all later scenes, "after the war," the set has been distressed to represent the damage that occurred during the war. Windows have been intentionally broken out or boarded over and woodwork damaged. Paint analysis documented that the fresh paint of the first scene was dirtied and discolored. Thus, by the time filming ended that summer of 1939, Tara was already in need of restoration. By the late 1950s, the Tara set had also become a significant tourist attraction in Culver City. Even Desi Arnaz, whose Desilu Productions then owned the set, was considering restoration of Tara in situ. But the set continued to decay until Desilu finally decided to clear the lot and gave the set to Southern Attractions, Inc., if it could be removed at no cost to the studio. In the spring of 1959, the set was taken down and the most durable portions salvaged. Windows, shutters, doors, porch posts and railings, cornice, and other elements were taken apart and apparently numbered in chalk. The four brick columns of the front porch are said to have been knocked down and buried on the site, while the wooden framework may have been burned on site. 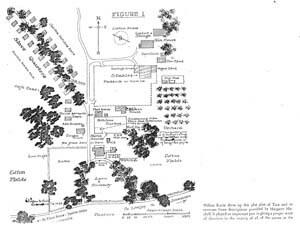 By the end of May, the set was gone and the site of the O’Hara plantation was cleared for other productions. Most famously, from 1965-1971, it was the site of the fictional Stalag 13 in the television series Hogan’s Heroes. 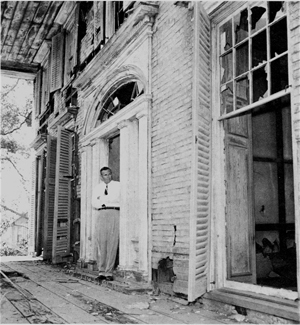 Julian M. Foster, a native Atlantan, lawyer, and real estate developer, was the president of Southern Attractions, Inc., and it was he who envisioned Tara reconstructed on 300 acres of forested land on Tara Road southwest of Jonesboro. 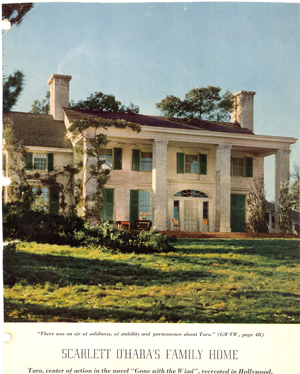 There he proposed to recreate Hollywood's Tara plantation in its entirety and, in the process, to "transport visitors as they approach Tara Plantation back a hundred years to early Georgia's rural setting." 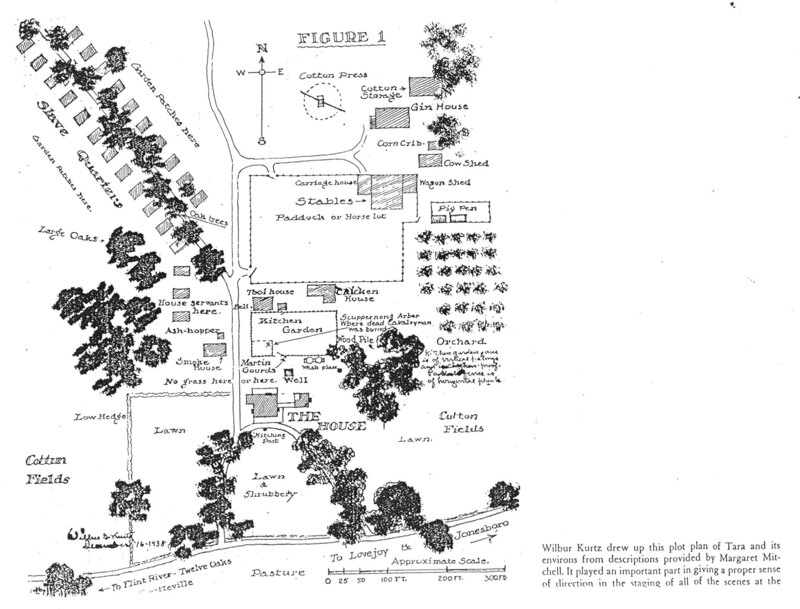 Part of that "setting" would have reportedly been a tourist motel in the plantation's slave quarters and the project was criticized as "Disneyland Williamsburg" in concept. Wilbur Kurtz derided the project privately and Stephens Mitchell wondered in print at the public's interest in this project while the city's genuine antebellum architecture was lying in ruins. Still, Foster's public relations campaign, under the direction of Howell Copeland and assisted by attorney Robert Troutman Jr. was effective, especially given the increasing interest in the upcoming Civil War centennial. 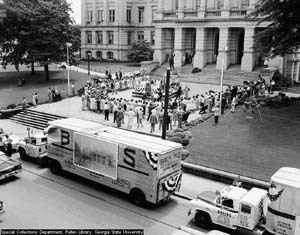 On 1 June 1959, in a ceremony on the north steps of the State Capitol, Governor Ernest Vandiver and a host of other local and state dignitaries welcomed Tara to Georgia. On one of the two vans containing the set was a banner that read "Tara Comes Home." Over the next few months, Foster retained several consultants to assist him in his development. 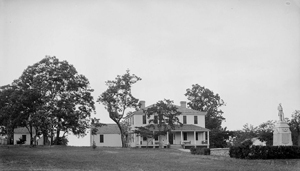 Merle C. Prunty, PhD, a geography professor at the University of Georgia was hired as a consultant on antebellum plantation life; William Byrd and Associates to provide landscape design; and Nancy Walker, an interior designer from Albany, Georgia, to coordinate recreation of the interiors at Tara. In addition, in October 1959, Roy E. Forehand, principal of the Atlanta architectural firm of Cunningham and Forehand, completed twenty-nine sheets of architectural drawings and specifications for the reconstruction of Tara. Forehand’s plans were not always faithful to the original set design and construction. In particular, original window sizes and detailing were altered in several instances. Although there were public statements that elements of the original set were to be used in the reconstruction, many alterations to minor details were made during the translation of movie set into a permanent structure. Construction appeared to be imminent, then, abruptly, nothing more was heard of the project. Like many other projects that sought to capitalize on the enormous popularity of the book and the film, Foster's grandiose scheme appears to have run afoul of the Mitchell family's jealous protection of their copyright interests. Whatever the reason, and it was never publicly stated in the press, Foster's investors received a refund and Tara spent the next twenty years hidden away in a series of warehouses. 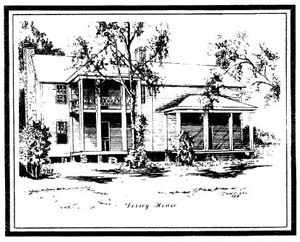 In 1979, Mrs. Betty Talmadge—whose Lovejoy residence, the historic Dorsey-Talmadge House (Figure 5), was thought by many to have inspired Margaret Mitchell's Twelve Oaks—learned of the existence of the movie set through one of the periodic newspaper articles that always asked "Where's Tara?" Recently divorced, she was already opening Lovejoy Plantation for all sorts of special events, capitalizing on an Old South theme and featuring elaborate barbecues. She had only a vague idea of somehow using the Gone With the Wind set in that context, but she thought it was worth preserving. Negotiations to purchase the set from Foster were interrupted by his untimely death in the fall of 1979, and nobody seemed to remember where the set was stored. Hiring a helicopter, Mrs. Talmadge was finally able to find the old barn that she had visited with Foster and acquired the set from Foster's estate in December 1979. In the summer of 1980, Talmadge learned that Philip Fitzgerald’s old house was about to be demolished. 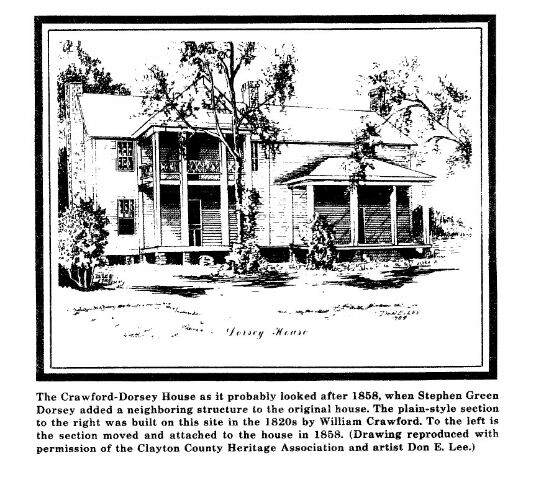 She soon acquired it as well, dismantling the 1870 addition and moving the original portion of the house to what she hoped would be a temporary site in the field across from her Lovejoy home. Unfortunately, she was never able to see the house restored, and it was damaged by a tornado and destroyed in July 2005. In 1989, the Atlanta History Center mounted a major exhibit commemorating the fiftieth anniversary of the premiere of the film version of Gone With the Wind. Entitled "Gone With the Wind: The Facts Behind the Fiction," the exhibit showcased original costumes, set pieces, designs and photographs as well as excerpts from Wilbur Kurtz' daily journal of the filming. 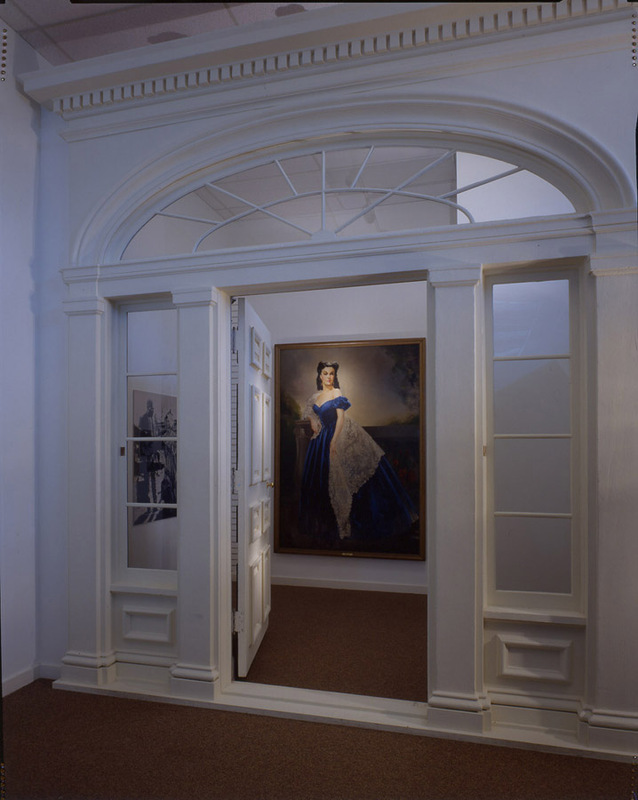 The centerpiece of the exhibit was the original Tara front door with its sidelights and fanlight, restored for the exhibit by the author, courtesy of Mrs. Talmadge. Although apparently identified and numbered in 1959, the elements of the set had lost all semblance of order during the course of three or four increasingly careless moves. As part of the restoration, the disassembled set pieces were sorted, tagged, and cataloged. 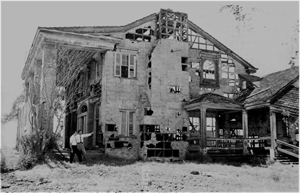 Surviving set elements included the windows, doors, shutters, and cornice from the main house; the columns, stairs and banisters from the side porch and breezeway; and a few pieces from the detached kitchen. 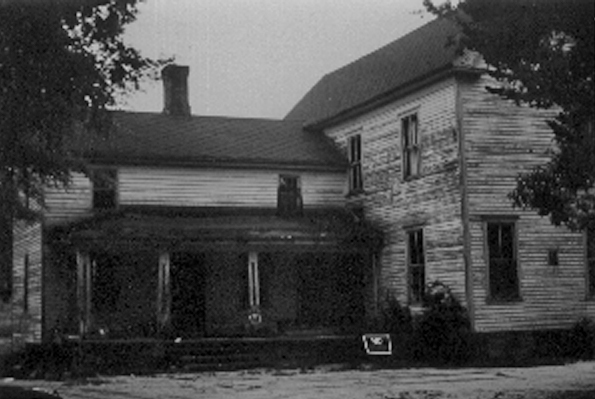 The framing, roof, faux brick siding, and great brick columns on the front porch were destroyed in 1959, although small fragments of the faux brick siding were located still attached to window casing. 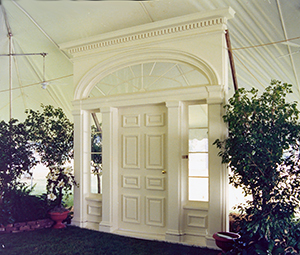 Rot had taken its toll on the soft fir which was used for all of the set’s millwork, but the use of epoxy consolidants allowed retention of most of the historic fabric, including much of the plywood paneling that was used to face the door and side panels. The plywood surround for the fanlight had been lost and had to be replicated new. Parts of the curved, molded casings around the fanlight were also lost, mostly to rot, and had to be recreated by craftsmen at Randall Brothers Lumber Company in Atlanta based on original profiles. Only the bottom rail of the fanlight sash survived, but it was incorporated into a replica of the original sash which was also created by Randall Brothers. All of the original fanlight and sidelight glass was missing and had to be replaced. Door hinges were intact, but the original rim-lock was lost. It was replaced with a new Baldwin lockset that replicated the appearance of the original. 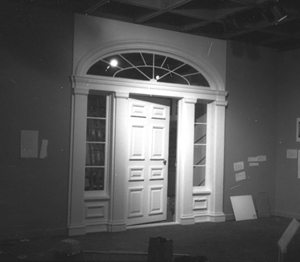 Because the installation at the History Center was not permanent and the doorway would have to be moved after the exhibit closed, it was reconstructed in separate components that included four columns, two sidelight panels, the fanlight assembly, the cornice, and the door itself. These then were assembled on-site at the History Center’s exhibit hall, except for the cornice which was omitted because the ceiling was too low. The set had apparently never been repainted after 1939, but the original painted finishes were badly worn. 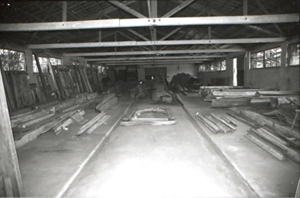 Samples of the original interior and exterior finishes were sent to Frank S. Welsh for lab analysis. He determined that the exterior of the set was finished with a flat, white, linseed-oil-based, lead-free paint with a Munsell color close to 5 Y 9/0.5. The interior was painted with a flat, linseed-oil-based, lead-free paint in a deep grayish blue determined to be close to Munsell 5 B 6/1.5. These colors were used for repainting the set, using custom-matched Pratt and Lambert alkyd paints. The original flat finish, which had been used to minimize reflective light during filming, was also recreated. A two-inch strip on the interior and exterior were not repainted but left as "witnesses" to the original finishes. The exhibit closed in the spring of 1990, and the doorway was disassembled and placed in storage. 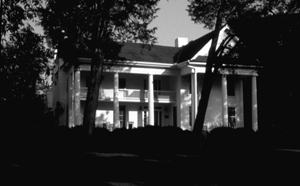 In September 1990, Mrs. Talmadge had it re-erected for a private event for Ted Turner and Jane Fonda at Lovejoy Plantation. This time the cornice was included in the installation. 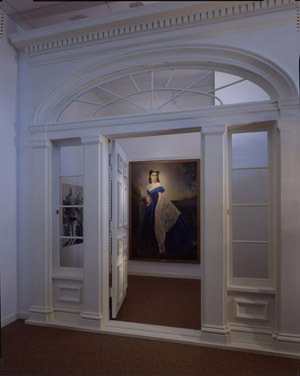 In 1998 the doorway was reconstructed once again and placed on exhibit at the Margaret Mitchell House Museum, where it remains in 2009. Mrs. Talmadge attempted to sell what remained of the set, and one of the windows and its shutters were taken out of the collection when a sales contract was signed and has been lost. The contract later fell through and the remainder of the Tara movie set remained in storage in 2006. Note that even though the absence of certain elements of the set might be noted in particular entries of this inventory, a variety of trim and other elements is included in the un-catalogued "Group Z" at the end of this inventory. Within this group will be found many of the various pieces of missing trim, etc., noted below. Most of the identifiable set units (i.e., windows, doors, etc.) have been tagged with an identification number corresponding to this inventory. Windows and doors are numbered, according to their location on the attached plan. Columns, steps, and porch railing have been tagged with the appropriate upper case letter corresponding to this inventory. Cornice and other unsorted material have been stacked together and generally tagged with the appropriate letter. Finally, please note that in the following inventory the assignment of a set location number to a particular set element that survives is somewhat arbitrary where there are, for instance, multiple windows or columns of the same dimension and detailing. During reconstruction, particular attention paid to such surviving evidence as "ghosts" in painted finishes, nail marks, and so forth, might allow more definitive placement of particular set elements. With the exception of the board and batten shutters on #18 and the unidentified board shutter in Z below, all of the shutters on the set were louvered. In addition to the seven louvered shutters that are still attached to window frames (noted below), fifteen others are more or less intact. The remainder, including three pair of the large front shutters, are disassembled. Two or three individual shutters may be missing. The window and door units to the set were numbered chronologically from left to right on the set plan. In the description that follows each number, location is given first, then dimension of sash and number of lights per sash, in standard notation. Following that are various other notes relevant to the particular element. 1. Window, left wing; 3’-0” x 5’-0”, 6/6; frame intact; upper sash intact, only one muntin; no lower sash; #3 cornice, detached. 2. Door under left side of porch, left wing; 3’-0” x 7’-0”, four-panel door; deconstructed. 3. Window, left wing; 3'0" x 5'0", 6/6; presence of #3 cornice uncertain, probably not; frame intact; upper and lower sash intact; muntins missing on lower sash. 4. Window, left wing: 3'0" x 5'0", 6/6: presence of #3 cornice uncertain, probably not; frame and sill only no sash or trim. 6. Window, left wing; 3'0" x 5'0", 6/6; #3 cornice detached: frame intact, right side trim missing; upper sash present, no muntins; lower sash missing top rail. 7. Window, second floor, left side of main house; may not have been part of actual set construction, although shutter is visible in Photograph #1; no elements located. 8. Window, second floor, left end of front facade, outside front porch; 3'0" x 4'0", 8/8; frame and trim intact; upper sash only; one louvered shutter attached. 9. Window, second floor, left end on front. under porch; 3'6" x 5'0", 8/8; frame and trim intact; left shutter attached, missing slats; right shutter attached, missing all slats, top and bottom rails; sash intact but some muntin damage; #2 cornice detached. 10. Window, second floor, left center on front, under porch; 3'6" x 5'0", 8/8; frame and trim intact; both sash intact, no muntins except some in top sash; #2 cornice detached. 11. Window, second floor, right center above front entrance; 3'6" x 5'0", 8/8; frame intact; right side cornice detached; shown as 3'0" window on Forehand plans. 12. Window, second floor, right end on front; 3'6" x 5'0", 8/8; frame intact; no trim; upper sash, no muntins; lower sash, no muntins or top rail; #2 cornice detached. 13. Window, first floor, left end on front, outside front porch;4'0" x 8'0", 12/12? ; only lower floor window to include 16" raised panel beneath window; frame, casing, trim, panel and sill intact; no sash present; #1 cornice detached, poor condition, missing dentil cornice. 16. 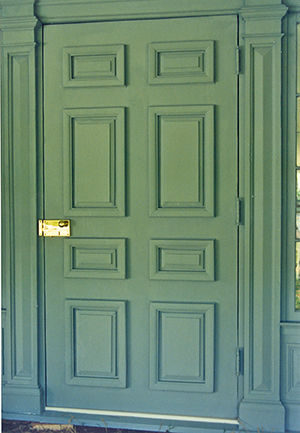 Front Entrance: eight-panel door, 4'0" x 8'0"; 12-light fanlight; 4-light over raised panel sidelights; dentil cornice; overall dimensions, 11'0" x 12'9"; restored (see Appendix B); on loan from Talmadge to Atlanta History Center. 18. Window, first floor, front on right wing; 2'8" x 4'0", 12/12; completely intact except trim missing from sides, best condition of any unit; includes board and batten shutters with one hinge and one latch set; shutter constructed of 3 3/4" boards and 1/2" round dowel attached to solid base; window sash are never visible on film; shown as 3'0" x 4'0", 8/8 window on Forehand plans. 19. Window, triangular roof dormer on front of right wing against main house; 1'8" x 2'3", four light fixed sash; jamb, sill, and all trim except on left; sash intact but no muntins. 20. Window, second floor, front end of right side; 3'6" x 5'0"?, 6/6 in movie but 8/8 on plans; window and shutters in possession of Carolyn Busby, Dunaway Gardens project; #3 cornice detached and included in this inventory. 22. Window, first floor, front end of right side; 3'0" x 5'0", 6/6; shown as 3'6" x 6'6", 12/20, with cornice on Forehand plans, but see photographs #4 & #6; frame and casing intact, trim missing right side; both sash present, no muntins; left shutter present, missing five slats. b. window sash, 4'0" x 3'11", 12-light fixed sash, muntins missing; no shutters constructed? 24. Window, end gable of right wing; 2'0" x 2'6", 6-light fixed sash, 9 light shown on Forehand plans; not shown in film; intact except for muntins. 25. Window, end of right wing; 3’-0” x 4’-0”, 6/6; Forehand shows 3’-6” x 5’-0”, 8/8 at this location; does not appear in final film; frame, casing, and trim intact; sash intact except for minor muntin damage; louvered shutters attached, missing only 5 or 6 slats. 26. Window, chimney end of kitchen; visible in passing in one scene, appears to be 4-light sash on film, deeply recessed, no shutters; Forehand shows 2'0" x 2'0" 4­light fixed sash with board and batten shutters; no elements identified. 27. Window, breezeway side of kitchen; clearly visible in one scene, appears to be 6/6 window without shutters, deeply recessed in "thick" walls of kitchen; Forehand shows 2'6" x 4'0" 6/6 at this location; no elements identified. A: four columns on porch, left wing; 9" boxed columns, 8'8" high; 17 1/2" diameter square capital with dentil; all columns intact; two columns el-shaped for installation at outside corners of porch; ghosts of railing present. B: seven columns, three pilasters on porch and breezeway, right wing; 9" boxed columns, 8' high; 21" capitals, see Forehand detail on A-13; brick pier bases missing; two columns with capitals intact, two with capitals detached; three columns with no trim, ghosts only; note that detailing does not appear to have been identical on all of these columns; two pilasters not located. Note: The four large front columns, which were approximately 21' tall, were constructed of brick and mortar. 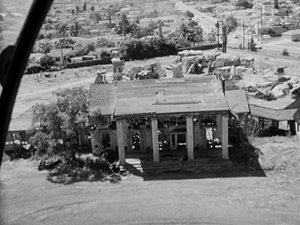 According to Herb Bridges, they were demolished and buried on the Culver City studio site, only to be later unearthed during later construction on the site. Mr. Bridges has photographs of the later discovery of the column remains and has some brick that was retrieved at that time. 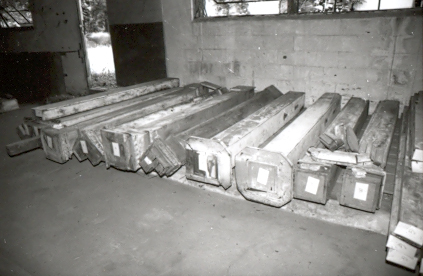 The wooden column capitals, probably 3 1/2' square, have not been located and may have been destroyed along with the columns. C. Five pieces, identical construction (see Forehand detail A-28; lower right; located on left wing and right wing porches; evidence for placement of these railings is confusing; 3 1/2" wide railing, similar configuration, was used in breezeway but none of it has been located. 1. 87" long, left wing porch? 2. 86 3/4" long, left wing porch? D. Breezeway steps; ten steps, 11' long, 24"??? wide; one step, 6' 9" long; 2x4 and 2x10 treads with 2" half­round nosing; full stringer and step assembly, minus some details, is intact; parts of other stringers intact; note burn damage on one step, possible alteration during filming. E: a number of large soffit and cornice sections, including framing, largest is nearly 16' long; substantial amount of all cornices intact but uncatalogued. Of special note is the largest section which has small fragments of the original "brick" with which the set was finished. These are the only known samples of this material from the set. F: gable roof from kitchen end opposite chimney; framing, furring strips and many of the original wood shingles are intact; roof is in two similar sections, both approximately 5' wide by 4'10" long; see Forehand detail on A-5. G: boxed beams and other material from right (?) 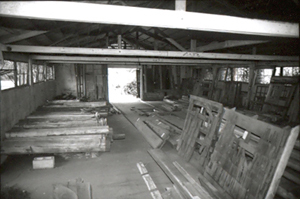 side porch ceiling; all beams are three-sided with chamfered edges, 3" x 5 1/2"; seven units, 78" long; three 113" long; one 111" long with six inch tongues on each end; a number of random width boards with this group. All have 3" wide paint "ghosts", spaced 24" between centers across the width of each board; longest of these is 16'. H: six jamb panels from interiors of the first floor windows on the front porch (#14, 15, & 17); 23" x 11'2"; 3/4" x 2 1/2" frame, 1/4" 3-ply wood sheathing; applied molding; varying condition; two in poor condition; never really visible on film; see photograph #8 for detail of these panels on film. J: these elements were removed during the 1989 restoration of the entrance. Z: a significant amount of uncatalogued trim, framing, and other pieces are included in this group; the position of many of these pieces in the set will become clear during reconstruction: under no circumstances should any of this material be discarded until that time. 1. 9 light casement window, 30 1/2" square, hinged; wooden glazing strips. 2. 12 light casement window, 48 1/2" x 34 1/2", hinged on short side; wooden glazing strips. 3. 12 light casement window, 34 1/2" x 29 1/2", wood glazing strips. 4. pair of board shutters, 22" x 48". B2. one on right side, second floor 3'6" x 5'0", 8/8; louvered shutters; "Mammy's window"
G. one on right side, first floor under side porch, 4'0" x 3'11", 12 pane, fixed sash, no shutters? The Atlanta History Center had some of the best sources, most importantly the Wilbur G. Kurtz Collection, which includes notes and photographs that he took while touring Clayton County in 1938, compiling information that they hoped would influence Selznick’s interpretation of Tara, The Kurtz Collection also includes. the journal that Kurtz kept while he was in Hollywood. along with a variety of artifacts and other information related to the filming of Gone With the Wind. The History Center also has a number of high-quality set still shots from the movie. 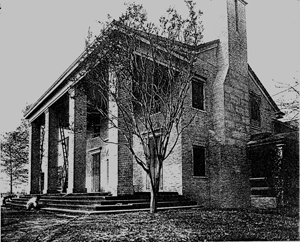 The Stephens Mitchell Collection at the Georgia Department of Archives and History included important documentation, including the earliest photograph of the Fitzgerald House. Darden Pyron’s biography of Margaret Mitchell, Southern Daughter, is one of the best published sources of information. In addition, during the course of restoration of the front doorway, paint samples from the set underwent laboratory analysis by Frank S. Welsh to determine the original colors of the set. Finally, Kipp Teague’s website, Retroweb.com, is a major source of photographs and other documentation for Tara, the Back Forty, and Hollywood in general. Anderson, Nancy. "Tara Is Falling to Pieces in Hollywood," Atlanta Journal Magazine. 20 November 1955, p. 14. Bridges, Herb. The Filming of "Gone With the Wind". Macon, GA: Mercer University Press, 1984. Bridges, Herb, and Terryl C. Boodman. The Definitibe Illustrated History of the Book, the Movie and the Legend. Fireside; Reprint. edition (October 15, 1989). Cameron, Judy, and Paul J. Christman. The Art of Gone With the Wind: The Making of a Legend. New York: Prentiss Hall, 1987. Carnes, Mark C. “Hollywood History,” American Heritage. September 1995. Daniel, Frank. "Scarlett's Tara Is Coming Home," Atlanta Journal. 25 May 1959. Also see "Battered Tara to Rest Here," Atlanta Constitution. 25 May 1959. __________. "Tara Will Occupy Site 15 Miles From Atlanta," Atlanta Journal and Constitution. 31 May 1959. __________. "Mr. Kurtz at Least Achieved This One Note of Authenticity," Atlanta Constitution. 1 June 1959. Gardner, Gerald. A Pictorial History of Gone With the Wind. New York: Gramercy Press, 1996. Harwell, Richard, editor. Gone With the Wind as Book and Film. New York: Paragon House, 1987. Kurtz, Wilbur G. “Technical Adviser: The Making of Gone With the Wind,” The Atlanta Historical Journal 22:2, Summer 1978. Kurtz, Annie Laurie. Atlanta and the Old South: Paintings & Drawings by Wilbur G. Kurtz. Atlanta: American Lithograph, 1969. Molt, Cynthia Marylee. 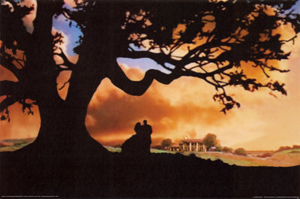 "Gone With the Wind" on Film: A Complete Reference. Jefferson, NC: McFarland & Co., Inc., 1983. Myrick, Susan. White Columns in Hollywood: Reports from the Gone With the Wind Sets. Macon, Ga.: Mercer University Press, 1982. ___________. “Saving Tara," Macon (GA) Telegraph. 3 September 1959. Pyron, Darden Asbury. Southern Daughter: The Life of Margaret Mitchell. New York: Oxford University Press, 1991. Shavin, Norman, and Martin Shartar. The Million Dollar Legends: Margaret Mitchell and "Gone With the Wind". Atlanta: Capricorn Corporation, 1986. Shavin, Norman. Regular column in Atlanta Journal. 27 May 1959. Teague, Kipp. 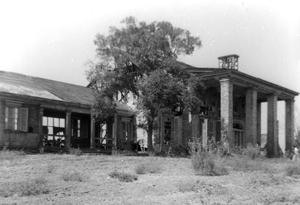 “Forty Acres, The Lost Studio Backlot of Movie & Television Fame (circa 1926-1976),” at http:// www.retroweb.com/40acres.html. Veale, Frank. "Plan to Reconstruct Tara Gone With the Wind?" Atlanta Journal. 9 July 1963.
. "Tara to Rise Again...'Someday'," Atlanta Journal and Constitution. 14 July 1963. Bell, Dr. Charles, curator of Selznick Archives, University of Texas, Austin. Telephone interview by author, September 1989. Forehand, Roy, former principal architect with Cunningham and Forehand. Telephone interview by author, May 1993. Kurtz, Wilbur G. Collection of unpublished notes and other manuscript material, Atlanta (GA) History Center. Mitchell, Stephens. “Fitzgerald Genealogy,” collection of mostly unpublished genealogical material. Georgia Department of Archives and History. 1. 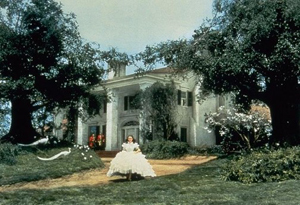 Color set still of set (1939): Right window visible on red brick one-story wing on left of main body of house; second floor window visible on left facade of main body of house; upper part of breezeway on right is visible. Black and white print is cropped version of color print. 2. Set still (1939): sign reads "Selznick Set Still/Director: Mr. Cukor/Pict. No. 108/Set No. 1/Ext Tara"; note absence of roof; best view of side porch. 3. Selznick Set Still (1939): sign is same as above but director is "Mr. Fleming." Shows full extent of front facades, including entire left wing and most of kitchen. Bannisters on left side porch; end of kitchen with window. 4. Set still (1939): close-up of front porch and first floor windows and doors. 5. Set still (1939): Breezeway and kitchen through stair hall door; columns and railing visible; door detail discernible; kitchen window facing house is visible. 6. 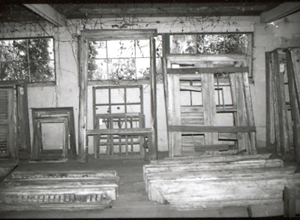 Set still (1939): Interior Parlor, set #5, soundstage set and not part of Tara facade set; note window panel; six similar interior panels were included on the facade. 1. Darden Asbury Pyron, Southern Daughter: The Life of Margaret Mitchell (New York: Oxford University Press, 1991), 430, 479-480, 505. 2. Mark C. Carnes, “Hollywood History,” American Heritage (September 1995), 77. 4. Quoted in Frank Daniel, “Mr. Kurtz at Least Achieved This One Note of Authenticity,” Atlanta Journal, 1 June 1959. 6. 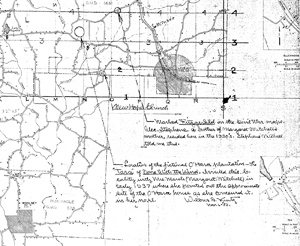 See Eugene M. Mitchell, "Queer Place Names in Old Atlanta," Atlanta Historical Society Bulletin, I, # 5, April 1931. 7. See Annie Laurie Kurtz, Atlanta and the Old South: Paintings & Drawings by Wilbur G. Kurtz (Atlanta: American Lithograph, 1969). 8. Quoted in Pyron, 480. 11. See Cameron and Christman, The Art of Gone With the Wind (New York: 1984), 114-125. 12. Susan Myrick, White Columns in Hollywood: Reports from the Gone With the Wind Sets (Macon, Ga.: Mercer University Press, 1982), 15. 13. Mark C. Carnes, “Hollywood History,” American Heritage, September 1995, 76. 16. Herb Bridges, The Filming of Gone With the Wind (Macon: Mercer University Press, 1984). 17. "Battered Tara to Rest Here," Atlanta Constitution. 25 May 1959, p. 1;. Norman Shavin, regular column in Atlanta Journal, 27 May 1959. 19. Nancy Anderson, "Tara Is Falling to Pieces in Hollywood," Atlanta Journal Magazine, 20 November 1955, 14. 20. The ceremony was hosted by Ray Moore, popular anchor for Atlanta's WSB-TV. Between 25 May and 2 June 1959, both daily papers included major stories on the Tara project. 21. Frank Daniel, "Tara Will Occupy Site 15 Miles From Atlanta," Atlanta Journal and Constitution, 31 May 1959; "Albany Native Aids in Furnishing Tara," Albany (GA) Herald, 11 July 1959; Susan Myrick, "Saving Tara," Macon (GA) Telegraph, 3 September 1959. 22. The originals of and rights to these drawings are in the possession of Cunningham, Forehand, Matthews, & Moore, Architects, Inc., of Atlanta. 23. In a telephone interview in May 1993, Mr. Forehand indicated to the author that there was never the intention to reuse the original pieces of the set, since to do so would be impractical. 24.See Frank Veale, "Plan to Reconstruct Tara Gone With the Wind?" Atlanta Journal, 9 July 1963, and "Tara to Rise Again...'Someday'," Atlanta Journal, 14 July 1963. 25. The original Selznick production studio drawings for Tara set construction were reportedly conveyed with the set to Julian Foster when he acquired the set, but Foster apparently sold the plans, perhaps to Ab Dickson of Jonesboro.